The coffee plant was discovered in Ethiopia in the 10th Century and has a white blossom that smells like jasmine and a red, cherry-like fruit. Back then, the leaves of the so-called “magical fruit” were boiled in water and the resulting concoction was thought to have medicinal properties. As the fame of the coffee plant spread to other lands, its centuries-long voyage was about to begin. Coffee spread quickly through the Arabian Peninsula, and for 300 years was drunk following the recipe first used in Ethiopia. In the 14th century, a new method of drinking coffee was discovered: the beans were roasted over a fire, ground and then boiled in water. In the mid 15th century, coffee cultivation reached Yemen. Yemen’s climate and fertile soil offered the ideal conditions for cultivating rich coffee harvests. With its new brewing method and aroma, coffee’s renown soon spread even further afield. Istanbul was introduced to coffee in 16. century during the reign of Sultan Suleiman the Magnificent by Özdemir Pasha, the Ottoman Governor of Yemen, who had grown to love the drink while stationed in that country. Coffee soon became a vital part of palace cuisine and was very popular in court. The position of Chief Coffee Maker (kahvecibaşı) was added to the roster of court functionaries. The Chief Coffee Maker’s duty was to brew the Sultan’s or his patron’s coffee, and was chosen for his loyalty and ability to keep secrets. The annals of Ottoman History record a number of Chief Coffee Makers who rose through the ranks to become Grand Viziers to the Sultan. Coffee soon spread from the palace to grand mansions, and from grand mansions to the homes of the public. The people of Istanbul quickly became enamoured with the beverage. Green coffee beans were purchased and then roasted at home on pans. The beans were then ground in mortars and brewed in coffeepots known as “cezve”. Coffee’s renown soon spread beyond the palace, grand mansions and homes. Istanbul’s first coffeehouses opened in the district of Taht-ul-kale in 1554. “Taht-ul Kale” means “inside the castle”, and is known today as Tahtakale. Many coffee vendors set up shop on Tahtakale’s Tahmis Sokak, which means “Roasted and Ground Coffee Street”. Coffee and coffeehouse culture spread rapidly and soon became an integral part of Istanbul social culture. Initially frequented by the city’s literati, coffeehouses soon became popular with the general public as well. Soon, there were 55 coffeehouses in Istanbul, most of which overlooked stunning views of the city. People came here throughout the day to read books, play chess and backgammon and discuss poetry and literature. Performances of traditional Turkish theatrical arts such as Shadow Puppetry (Karagöz) and Classical Turkish Drama (ortaoyunu) were first held at these coffeehouses. Europeans got their first taste of coffee in 1615 when Venetian merchants who had become acquainted with the drink in Istanbul carried it back with them to Venice. At first, the beverage was sold on the street by lemonade vendors, but in 1645 the first coffeehouse opened in Italy. Coffeehouses soon sprang up all over the country and, as in many other lands, they became a platform for people from all walks of life, especially artists and students, to come together and chat. Travellers who discovered coffee while staying in Istanbul extolled the matchless flavour of the beverage in letters they sent home to Marseilles. In 1644, the first coffee beans, along with the apparatus used to prepare and serve coffee, were brought to Marseilles by Monsieur de la Roque, the French ambassador. In 1660, merchants from Marseilles who had grown to love the beverage they had first tasted in Istanbul began to import coffee to the city, thus sating Marseilles’s growing appetite for coffee. The first coffeehouse opened in Marseilles in 1671. Initially, coffeehouses catered to merchants and travellers, but they soon became popular with people from all walks of life. Paris was introduced to coffee in 1669 by Hoşsohbet Nüktedan Süleyman Ağa, who was sent by Sultan Mehmet IV as ambassador to the court of King Louis XIV of France. Among the Ottoman ambassador’s possessions were several sacks of coffee, which he described to the French as a “magical beverage”. Süleyman Ağa swiftly became the darling of Parisian high society. The Parisian aristocracy saw it as a great honour to be invited to share a cup of Turkish Coffee with Süleyman Ağa, who regaled his guests with his pleasant wit and conversation. The ambassador related countless stories on the subject of coffee, which earned him the sobriquet of Hoşsohbet, or raconteur. Paris’s first real coffeehouse, Café de Procope, opened in 1686. It soon became a favourite haunt of the literati, a place frequented by renowned poets, playwrights, actors and musicians. Many famous figures such as Rousseau, Diderot and Voltaire became enamoured with coffee at Café de Procope. Following the trend set by Café de Procope, coffeehouses opened on practically every street in the city. 1683 marked the end of the Second Siege of Vienna. As the Turks retreated, they left their extra supplies behind. The abandoned goods included a large number of tents, livestock, grain and around 500 sacks of coffee. The Viennese had no idea what to make of the mysterious contents of the sacks. One Viennese captain claimed that the coffee beans were camel-feed and decided to dump the sacks into the Danube. News of the mysterious sacks reached a gentleman named Kolschitzky who had lived among the Turks for many years and had served as a spy for the Austrians during the siege. He requested the sacks of coffee, with which he was very familiar, as payment for his successful espionage services during the siege. Kolschitzky served small cups of Turkish Coffee to the Viennese, first going door to door, and then in a large tent that he opened to the public. Soon, he had taught the Viennese how to prepare and enjoy the beverage. Thus Vienna became acquainted with coffee. The Viennese coffeehouses that opened during this period set an example for coffeehouses in many other countries. England first became acquainted with coffee in 1637 when a Turk introduced the drink to Oxford. It quickly became popular among students and teachers who established the “Oxford Coffee Club”. The first coffeehouse in Oxford opened in 1650 and was called the “Angel”. In 1652, a Greek named Pasqua Rosée opened the first coffeehouse in London. Using his extensive knowledge of how to prepare and brew Turkish Coffee, he introduced his friends and clients to its peerless taste. By 1660, London’s coffeehouses had become an integral part of its social culture. The general public dubbed coffee houses “Penny Universities” as they were patronised by writers, artists, poets, lawyers, politicians and philosophers. London’s coffeehouses offered customers a great deal more than piping hot cups of coffee: the entrance fee of one penny allowed them to benefit from the intellectual conversation that surrounded them. The history of coffee in Holland is markedly different from that of other countries, as for many years the Dutch were more concerned with coffee as a trade commodity than as a beverage. Coffee first reached the country via Yemen in the 17th century. The Dutch began cultivating coffee in its colonies. In 1699, coffee beans were planted on the island of Java, thus laying the foundation for Indonesia’s coffee plantations. In 1711, the first Javanese coffee beans were sold on the open market in Amsterdam. The first coffeehouses in Holland opened in the 1660s. With their unique style that featured rich décor, a warm atmosphere and lush gardens, they stood out from coffeehouses in other countries. Located mainly in the financial districts of Dutch cities, they became known as places where merchants and financiers conducted business meetings. In the 1680s, the Dutch introduced coffee to Scandinavia, the region which today has the highest per capita consumption of coffee in the world. Coffee was introduced to Germany in 1675. The first coffeehouses opened in 1679-1680 in Hamburg, Bremen and Hanover. At first, coffee was considered a beverage of the nobility. The middle and lower classes were not introduced to coffee until the early 18th century, and it was only much later that it came to be prepared and consumed at home. As coffeehouses were the domain of men, middle class women established their own “coffee clubs”. Coffee reached North America in 1668. The first coffeehouse in New York, “The King’s Arms”, opened in 1696. 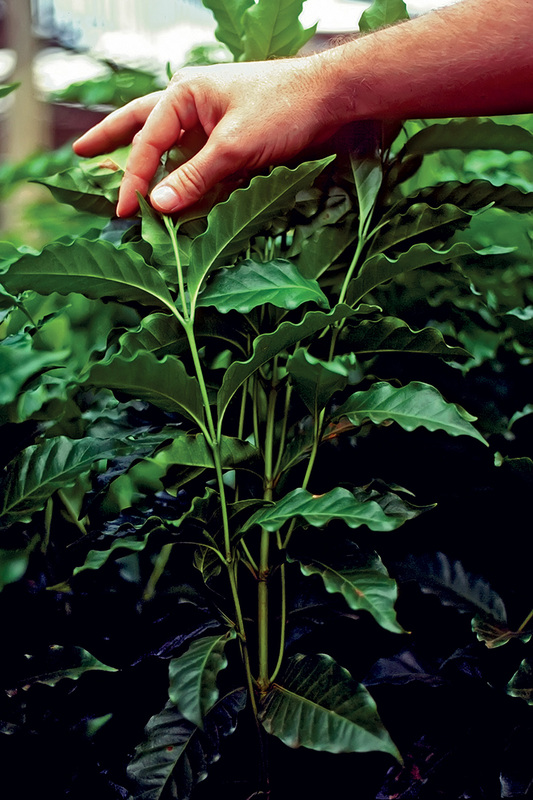 In 1714, the Dutch presented Louis XIV with a coffee sapling from their plantations on Java. The sapling was planted in the royal Jardin des Plantes in Paris. In 1723, a French mariner named Gabriel du Clieu took a sapling from the Jardin des Plantes to the island of Martinique. 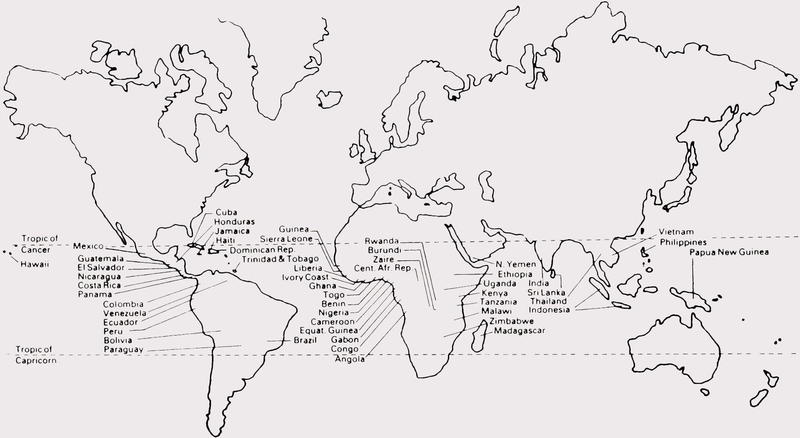 From here, the coffee plant spread to other Caribbean islands, as well as to Central and South America. In 1727, a Portuguese sailor named de Mello Palheta carried coffee saplings to Brazil from French Guyana. Today, Brazil is the number one producer of coffee in the world, accounting for 35% of global coffee production. In 1730, the British began cultivating coffee in Jamaica. By the mid 19th century, coffee had become one of the most important commodities in world trade. The coffea plant is a member of the Rubiaceae family. Although this family has a large number of sub groups and species, only two strains have any commercial value for coffee production: Coffea Arabica and Coffea Canephora (Robusta). The coffee tree grows in the belt between 25 degrees north and 30 degrees south of the equator where rainfall is high, the temperature never falls below freezing and the average temperature is between 18-24° centigrade. The tree will die if it encounters frost, and sudden heat fluctuations also damage the tree. Since the coffee tree flourishes in humid conditions, it must be grown in tropical regions with regular rainfall. Resembling the Camellia bush, the coffee tree sports dark, shiny and pointed leaves. When left to grow naturally, some varieties will grow up to 7 meters tall. However, coffee plantations generally keep the trees from growing higher than 2-3 meters in order to ease harvesting. 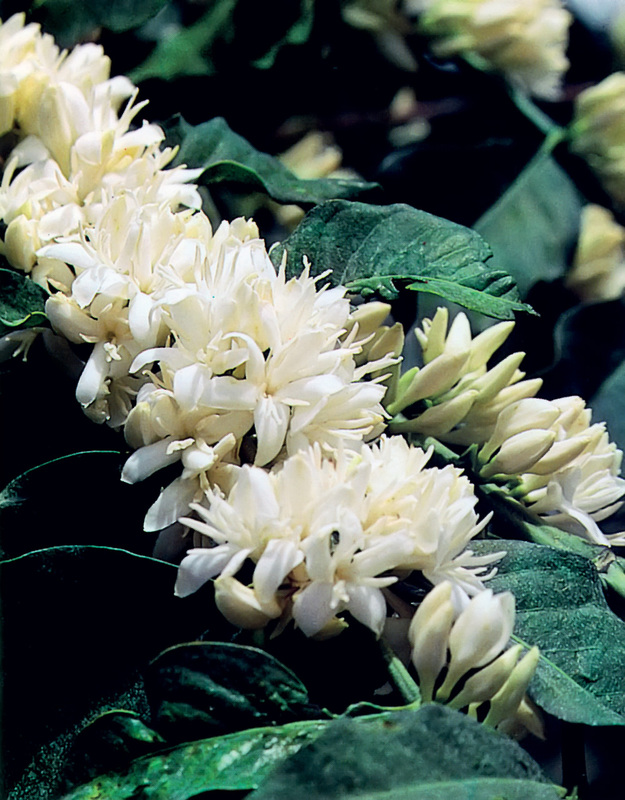 The coffee tree’s delicate white blossom exudes a distinctive fragrance, resembling that of the jasmine flower both in terms of appearance and odour. This flower bears a green fruit. It takes 3-5 years for a sapling to begin to yield fruit. Once mature, the tree will bear fruit several times a year. Coffea Arabica is descended from the coffee plants first discovered in Ethiopia. It grows at elevations of 800-2000 meters on plateaus or volcanic slopes. It blossoms after each rainy season and its fruit takes nine months to mature. The annual yield of a typical arabica tree yield is 5 kg, which produces 1 kg of actual coffee beans. The oval, greenish-yellow coffee beans of the arabica tree have less caffeine than those of the robusta plant. In addition, it has a finer taste and sweeter aroma then the robusta. Coffea Arabica makes up 70% of global coffee production. However, due to its susceptibility to disease and sensitivity to climatic fluctuations, it is more difficult and more expensive to cultivate. The most famous varieties are the Bourbon bean grown in Brazil, the Middle East, India, and Indonesia and the Typica bean, which is largely cultivated in Latin America, followed by the Tico, Blue Mountain, Mundo Novo, Caturra and San Ramon varieties. 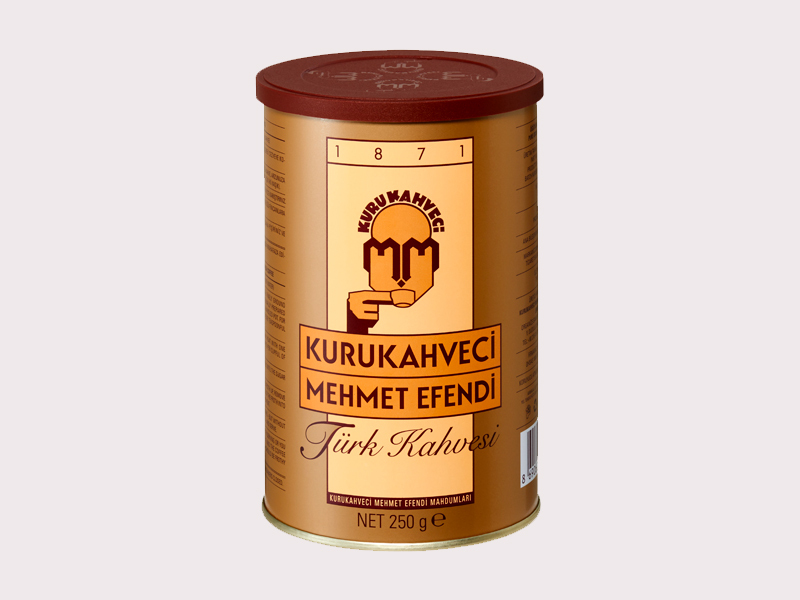 Kurukahveci Mehmet Efendi uses carefully selected beans from the highest quality coffea arabica bean varieties in its production of Turkish Coffee. Coffea Robusta is grown at elevations between 0–600 meters. Unlike the arabica, the robusta flowers irregularly and the fruit takes 10–11 months to mature. The coffee produced from the robusta’s round, yellow-brown beans contains around twice the caffeine of arabica coffee. Robusta makes up 30% of global coffee production. It is easier to cultivate as it is hardy and not sensitive to disease and extreme weather conditions. The most well known varieties of robusta are Java-Ineac, Nana, Kouliou and Congensis. Two or three times a year, after heavy rains, the coffee tree bears wonderful, pure white flowers. The blossom’s heady fragrance has been likened to that of jasmine or the orange blossom. A tree that has recently matured will bear 20-30,000 flowers a year. The coffee blossom begins to wilt within a few hours of opening, already preparing to produce fruit. The coffee blossom is white and smells like jasmine. 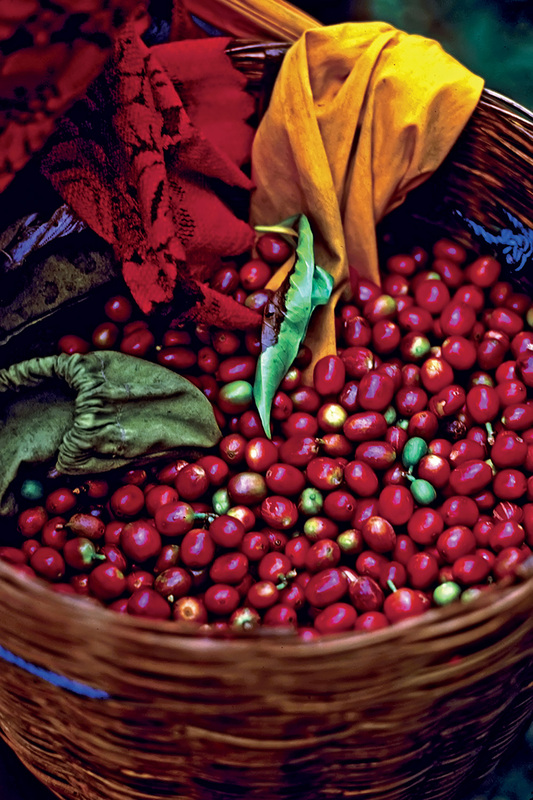 Due to its similar size, shape and colour, the fruit of the coffee tree is known as a “cherry”. Within the fruit are two beans. The sides of the beans that face each other are flat, while the beans’ outward facing sides are curved. 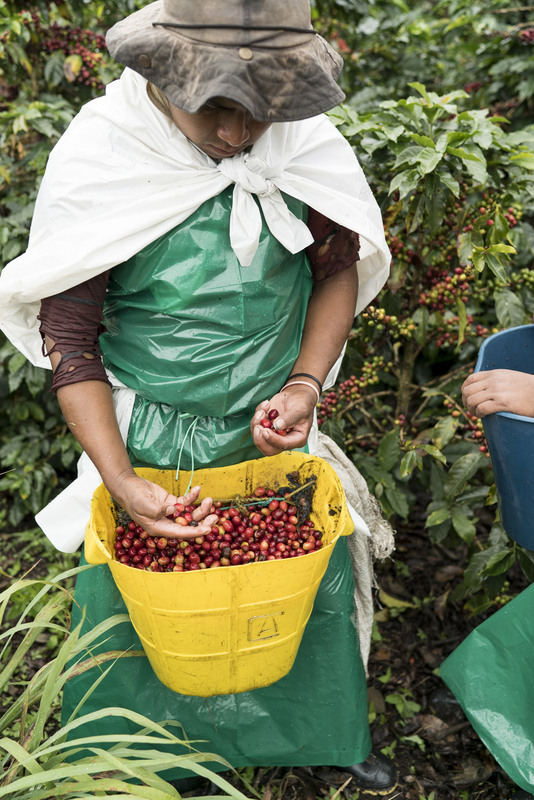 The coffee beans are encased in a protective jacket or parchment that has the same shape. The flat side of each bean sports a deep crack or crevice filled with hard endosperm covered in a thin membrane. The membrane is encased in a harder shell. If the coffee bean is to be used as seed, then the seeds will not be separated from their protective shell. The fruit of some coffee trees only bear one bean rather than two. This bean (a peaberry) is much rounder than normal coffee beans. These beans are processed separately and generally fetch a much higher price than normal beans. Coffee cherries must be carefully monitored as upon ripening they will begin to rot within 14 days. Coffee is cultivated in plantations in over 75 countries around the world. An enormous amount of effort goes into cultivating and harvesting the crop before it reaches the commercial coffee roaster. The entire process lasts a year and includes painstaking processes such as harvesting the ripe fruit and separating the beans from their shells – all of which have an impact on the ultimate quality of the coffee. 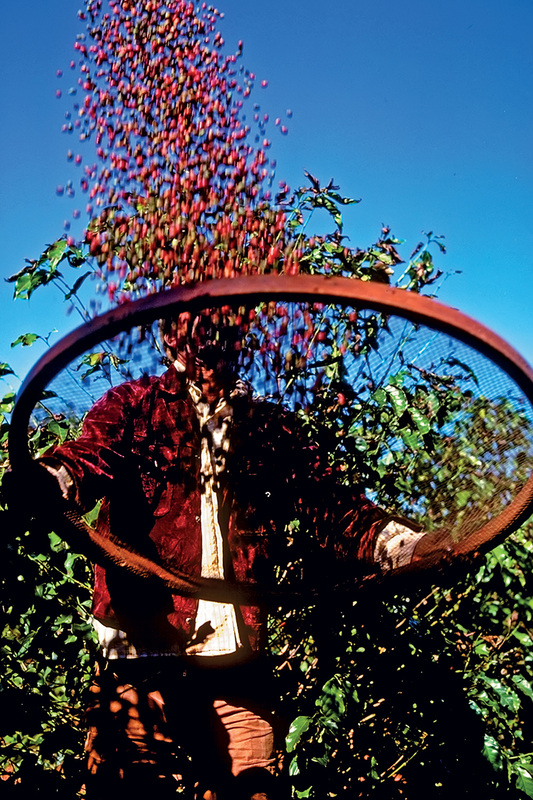 In most arabica-growing areas the ripe cherries will be carefully handpicked and dropped into the picker’s basket, the weight of which determines the picker’s pay and can be as heavy as 100 kg. A tree will be revisited many times until every cherry on it has ripened. The quality of the crop is improved by only harvesting the ripe cherries. However, handpicking is a rather expensive method as it is a slow and labour intensive process. As a result, this method is only used to harvest the finest varieties of coffee. This method is most often employed in Brazil, where the flat terrain of the estates allows the trees to be planted in even rows. A harvester will strip-pick the entire tree when the majority of its cherries are ripe by sliding his or her fingers down the branches, causing all the cherries, ripe or not, to fall to the ground. On some large plantations, a large vehicle will be driven slowly down the row of coffee trees, and its revolving arms will knock the looser, and hopefully riper, fruit to the ground. Workers then gather the scattered fruit, winnowing it with large meshed hoops, which they use to throw the cherries up in the air to separate them from the twigs, leaves and dust. No matter how much care is taken in strip-picking, under or over ripe fruit invariably gets in with the ripe cherries. As a result, the fruit must later be processed by a sorting machine. Wet processing is usually employed with high quality coffees. 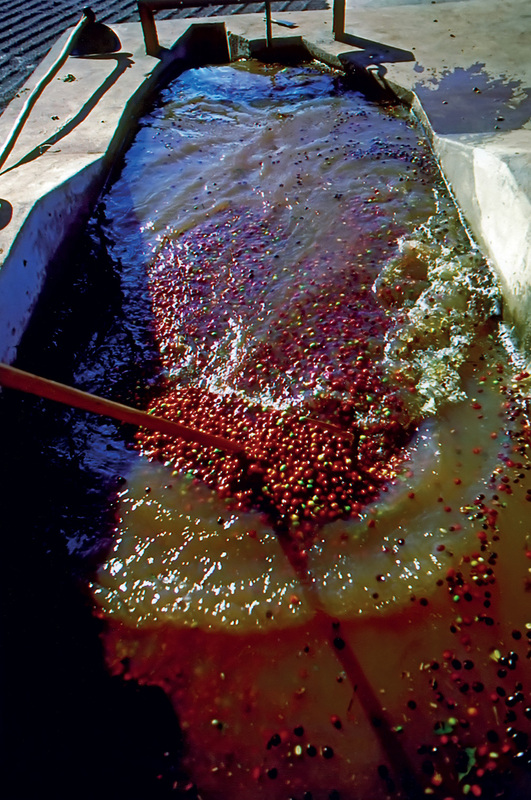 Before any fermentation sets in, the freshly picked cherries are immediately washed in large tanks from which the water carries them into a system of channels. Staying in contact with the fresh-flowing water helps to loosen the outer skin while the cherries are carried towards a de-pulping machine. As they continue on their journey along the channels, the cherries are sifted. After the beans have been sorted by size and weight, they are sent to fermentation tanks where any remaining mucilage is broken down by natural enzymes during a 36-hour soak. During this stage known as the fermentation period, the beans are carefully monitored to ensure that their aroma is not adversely affected. After the fermentation process is complete, the beans are rinsed and spread out on patios or wire-mesh platforms to dry in the sun. 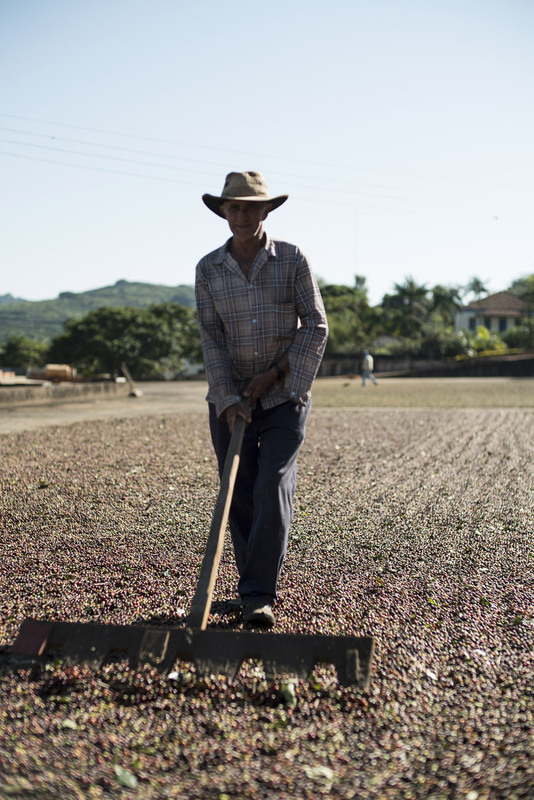 As is also the case in the dry method, the beans are dried in the sun for a couple of weeks or placed in low-temperature drying machines until their moisture content is reduced to 11–12%. The drying process must be performed correctly in order to preserve the quality of the coffee. Still in their parchment jackets, the beans are stored in special warehouses until transportation. Just before they are sent to the roasters, the beans go through one final process where a machine removes the parchment jacket. The wet method is more expensive than the dry method as it uses much more equipment and is much more labour intensive. Dry processing also begins with cleaning the newly picked cherries with pressurized air, sieves or water to remove any foreign materials such as leaves. In addition, unripe and/or defective cherries float to the surface and can be easily removed. The cherries are then spread out in the open air to dry in the sun for 2-3 weeks. The beans are turned over and raked frequently to ensure that they dry completely. At night and during rainy weather, they are covered to protect them from harm. In arid lands, the beans are sometimes laid out to dry in the sun without being washed first. After being dried in the sun, the beans are placed in hot air machines to reduce their moisture content to 11–12%. Next, they are stored in silos or may be sent to a special facility for final hulling where the shells and outer layers are removed by a special machine. As a final step, the beans are sorted according to size and weight. The beans are then put in 60 kg bags to be stored in warehouses or are immediately loaded onto ships for export. In the 17-18th centuries, Western powers began to cultivate coffee in their colonies in Africa, South America and Asia. After independence, these former colonies continued to produce coffee and today export green coffee beans all over the world. The birthplace of coffee, Ethiopia is one of the world’s most important producers in terms of both quality and quantity. Ethiopian coffee possesses both a wonderful aroma and low caffeine. Some of the regions that produce the highest quality coffee are “Sidamo”, “Kaffa”, “Harrar” and “Wellega”. Ethiopian coffee is described as lemony, light, winey and floral. Kenyan wet-processed arabica coffee is grown at high altitudes and is one of the best in the world. Kenyan coffee is of consistent high quality as it is strictly regulated by the nation’s coffee board. Superior quality “AA” Kenyan coffee is much sought after by gourmets and certain special manufacturers. Due to its high acidity levels, Kenyan coffee is described as sharp, fruity and sometimes lemony/citrus. Costa Rica is one of the best places in the world to grow coffee thanks to its geography and climate. 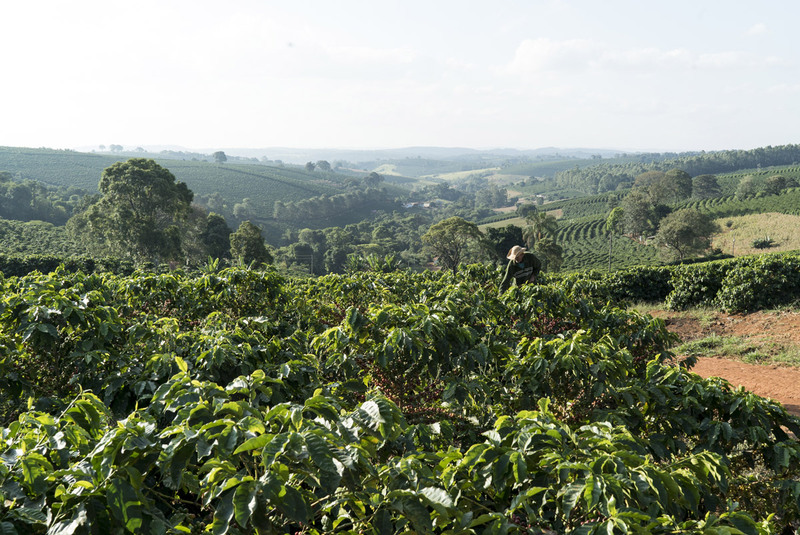 Wet-processed Arabica is cultivated in plantations in the countryside surrounding the capital, San Jose. The best known varieties are “Tres Rios”, “Tarrazu”, “Dota” and “San Marcos”. Costa Rica coffee is a favourite with coffee lovers thanks to its strong and lovely fragrance and high acidity levels. This country also produces one of the best coffees in the world. The country’s premium crop is named after Guatemala Antigua, an ancient city destroyed by earthquake in 1773 located near today’s capital city, Guatemala. However, as coffee is cultivated over a wide-ranging area, there are regional variations in flavour. Its general taste profile can be described as mid to full bodied, floral, acidic, and a blend of smoky, spicy and chocolaty flavours that create a wonderful balance. With its matchless flavour, Jamaican “Blue Mountain” coffee is an important source of income for Jamaica and grows in a small region in the east of the island. Other countries may try to cultivate this famous and rare coffee and market it as “Blue Mountain”, but the genuine article only grows in Jamaica. With its distinctive taste, “Blue Mountain” stands out from all the other coffees grown in the Caribbean. Thanks to its high quality, limited supply and rarity, “Blue Mountain” coffee is quite expensive. 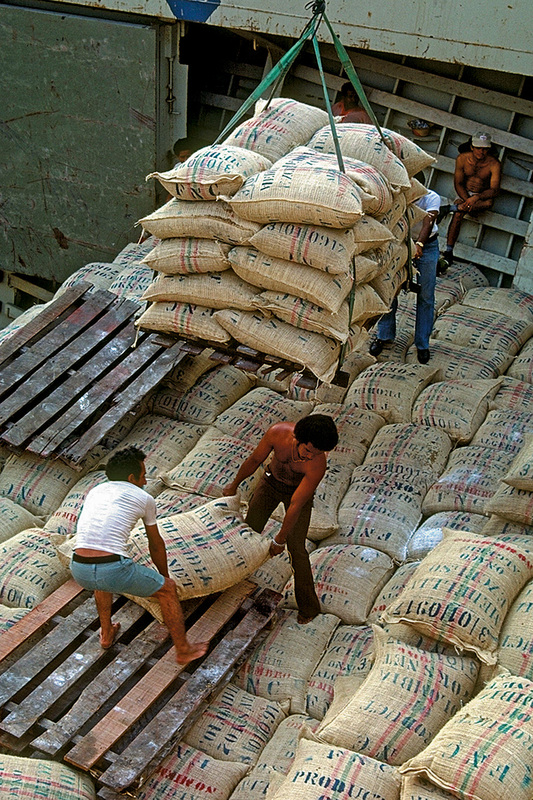 Unlike other varieties of coffee, real “Blue Mountain” coffee is stored and exported in barrels rather than sacks. Not overly acidic, it has a very light, nutty, semi sweet and smooth flavour, making it the world’s most famous, most expensive, and most talked-about variety of coffee. Supplying one third of the world’s coffee, Brazil’s coffee huge plantations are comprised of millions of trees that cover the peaks of the country’s central and southern regions. In addition to being an important player in the commercial coffee industry, Brazil is the largest consumer of coffee in the world, with an annual consumption of 720 million kg. Indeed, the Brazilians call breakfast “café da manhã”, or morning coffee. Brazil mainly grows arabica plus a small quantity of robusta, and the crop is generally dry processed. Each of Brazil’s states produces different varieties of coffee. However, the “Bourbon Santos” variety is the preferred favourite of coffee experts. Gourmets describe Brazilian coffee as easy to drink without too much acidity. Supplying 12% of the world’s coffee, Colombia owes its rich soil to its actively volcanic geography. Mountain ranges separate central Colombia into three regions (cordilleras) that run from north to south. 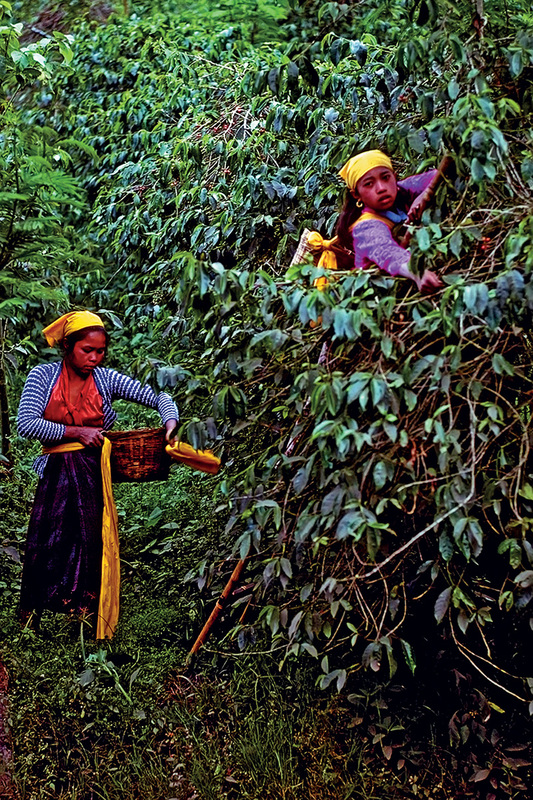 The best coffee comes from the central and west cordilleras. The best coffee varieties grown in the central cordillera are “Medellin”, “Armenia” and “Manizales”. With its full body, rich flavour and refined, medium acidity, “Medellin” is the best-known variety. “Manizales” and “Armenia” generally have a lighter body and are less acidic. The eastern cordillera’s best-known two coffees are “Bucaramanga” and “Bogota”, which is grown in the area around the nation’s capital. Bogota is considered one of Columbia’s most refined coffees and is less acidic than the “Medellin” variety. “Bucaramanga” coffee has a lighter, mellow flavour; like “Sumatra” coffee, it is full bodied, low in acidity and has a rich flavour. Hawaii has been growing coffee since 1818. 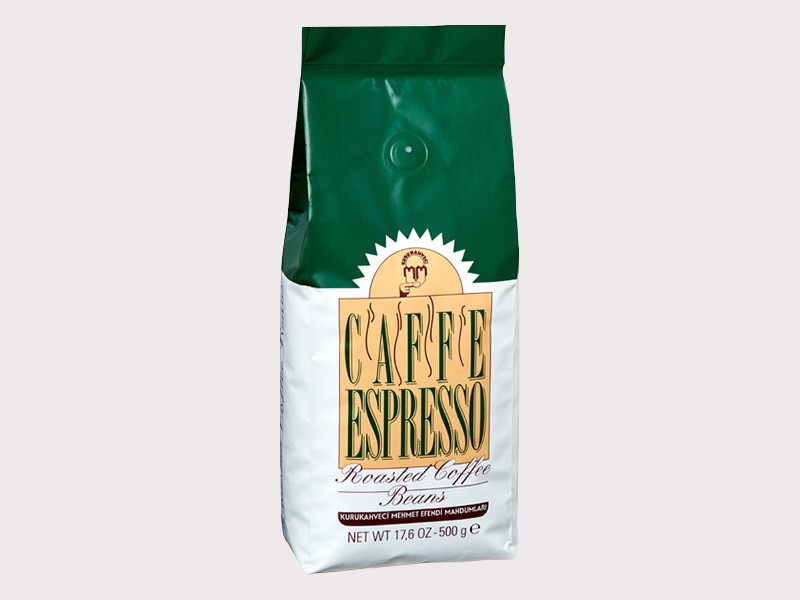 The only coffee grown in United States territory, Hawaiian coffee is known as “Kona” coffee. Expert opinion on “Kona” varies, but it is often compared to Jamaican Blue Mountain coffee. Both coffees are mildly acidic, of medium body, and with a pleasant, nutty aroma. Some coffee experts also characterise it as having a spicy flavour with a hint of cinnamon. As is it is only grown in a small region, Kona is also an expensive coffee. Almost all Indonesian coffee is grown on three islands: Sumatra, Java and Sulawesi. Sumatra supplies 68% of the country’s total production. The island’s arabica varieties are marketed under the “Sumatran” and “Blue Sumatran” names. With its rich aroma and low acidity, “Mandheling” is known as “the world’s heaviest coffee”. “Gayo Mountain” is described as sweet, spicy, exotic and herbal, while some experts believe that “Ankola” is the world’s best unwashed arabica. The island of Java accounts for 12% of Indonesia’s coffee production. A plague of leaf rust (hemileia vastatrix) in the 19th century left only the arabica stands at higher elevations unscathed. Known as “Old Java”, this arabica variety is described as smooth, rich, with an aromatic, smoky character. The coffee trees lost to the blight were replaced with “Estate Java”, which is more acidic and lighter-bodied than the “Old Java”. Deforestation and erosion are two of the greatest environmental problems facing the tropics. To prevent these from happening, priority should be given to planting fast-growing trees such as the coffee, lemon and orange trees. The coffee tree blossoms immediately after the dry season, and then drops its leaves – leaves that are particularly rich in nutrients and minerals that enrich the soil. This natural fertilizer improves the fertility of the soil. 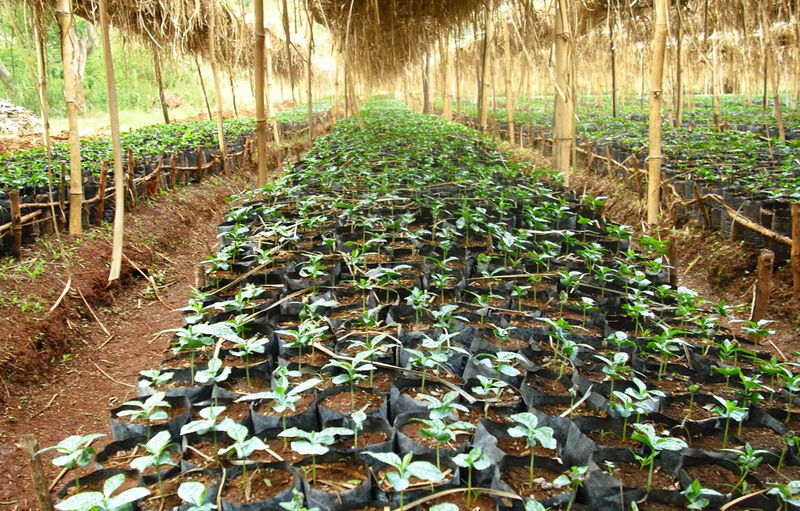 Coffee trees and other trees planted beside them serve as natural windbreaks and provide shade. These trees drop more leaves than all other tropical plants, and are more quickly absorbed – first by the soil as fertiliser and then by the trees. The cypress and pine trees planted around coffee plantations to provide shade also provide nesting for many varieties of birds whose habitats have been destroyed by indiscriminate clear cutting. 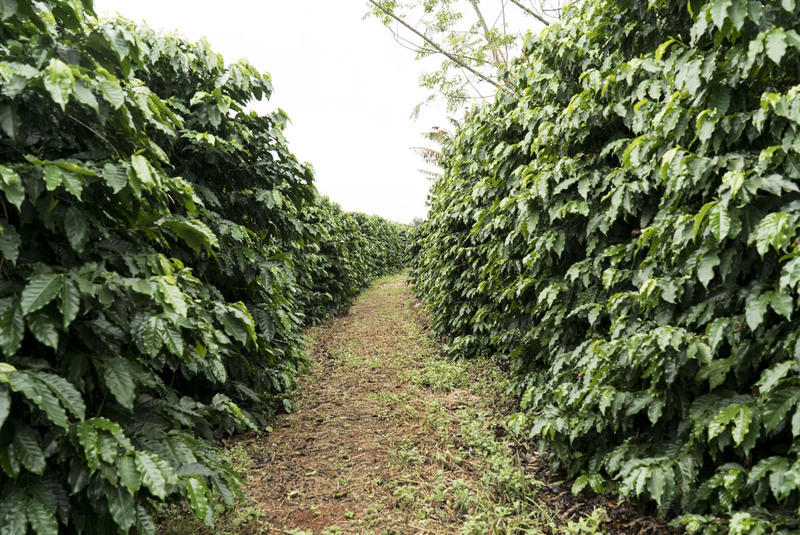 The leaves that fall off the coffee trees during heavy tropical rains during the rainy season create a protective layer over the soil that helps prevent erosion. In the dry season, this layer of coffee leaves keeps the soil moist and provides the ideal conditions for all tree growth. Furthermore, coffee cultivation provides employment to millions of people every year. The sustenance needs of some 20 million families in coffee producing nations are met by working on coffee plantations. Turkish coffee, espresso or filter coffee… Whatever the variety of coffee, roasting companies make purchasing decisions based on the results of taste tests conducted on samples of green coffee beans. In order to produce high quality coffee, they look for beans that fulfil specific criteria. Using their extensive experience, the coffee experts at Kurukahveci Mehmet Efendi only subject the finest arabica coffee samples to visual and sensory tests. Coffee is only purchased after the highest quality batches have been selected. Coffee tasting, also called “cupping”, is the sensory evaluation of coffee, which assesses more than just taste. The senses of smell, taste and “feel” are all involved in this analysis. Smell and taste are very dependent on each other and difficult to separate in assessment. The sense of “feel” involved in assessing coffee evaluates the coffee’s body. All coffee is only purchased after being tested in this manner. Every day, the tasting team at Kurukahveci Mehmet Efendi samples the flavour of the raw coffee beans in order to make the necessary analysis. Fragrance: The term used in evaluating the smell of ground coffee. Taste: The term used in evaluating the flavour of the coffee. Nose: The term used in evaluating the fragrance of brewed coffee. Acidity: A desirable attribute in coffee. It indicates the sharpness and bitterness of certain types of coffee. Body: A term used to describe the physical consistency of the beverage in the mouth. Bouquet: After evaluating the fragrance, aroma and taste, this term is used to describe the lasting impression of the combination of these factors. Bitterness: A sharp, biting taste. Not an entirely undesirable attribute. This attribute can be enhanced or diminished according to the method by which the coffee is roasted and prepared. Roasting is the briefest yet most important and painstaking stage in coffee production. This process carries a heavy weight of responsibility. Both time and money can be lost in a brief moment of carelessness, rendering the labour of hundreds of people on the fields and in the production process pointless. The heat applied to the green coffee beans during roasting changes their colour from the original light green to brown. As the heat rises, the beans lose water. Before roasting, the green coffee beans have no aroma or fragrance; the roasting process uncovers over 900 aromas hidden in the beans. Not every variety of coffee is roasted in the same manner. This is what makes roasting an art form. It requires experience, knowledge and expertise accumulated over many years. An experienced roaster knows the limits and potential of a given type of coffee. It is only through this skill and experience that the roaster is able to maximise the quality of the coffee. While machines are used to roast, monitor and chart the coffee beans, experienced roasters still rely on their ears during the roasting process. The coffee roaster knows that the roasting process is almost complete when the beans begin to pop and “sing”. Afterwards, the beans are transferred to a cooling tank. Kurukahveci Mehmet Efendi stresses the importance of the roasting process. Roasting requires perfectionism; there is no margin for error. The coffee roaster carefully conducts and orchestrates the specially designed roasting machines that maximise the quality and performance of the roasted coffee. The light green coffee beans are thrown into the roasting machines, which have been preheated to 200 to 250 degrees Celsius. At 100° C the beans change colour from green to yellow. The water in the beans begins to evaporate. They first exude a grassy smell, and then one of boiled vegetables. At 120–130° C the beans turn chestnut brown and begins to smell like toast. At 130–140° C the beans appear speckled, freckled and wrinkled. At 150–160° C the coffee beans give off a smell of roasted grains. This scent signals that the coffee is about to reach its true aroma. At 180° C, due to the high temperature, the beans begin to release the vapours trapped within them and the coffee reveals its true aroma. The beans turn a cinnamon colour and begin to expand. Above 180° C, the beans begin to darken and the coffee’s aroma grows stronger. 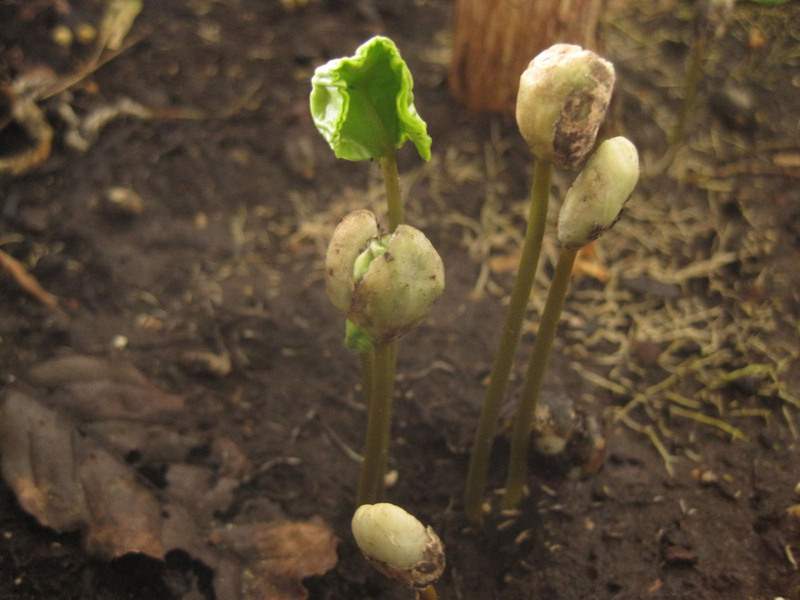 The beans expand further and begin to pop. The surface of the beans begins to shine. As the beans continue to expand, their surface becomes smooth and their colour uniform. At 180–200° C the beans expand to three times their original circumference. At 210° C the cracking sounds can be heard again. The coffee beans’ colour and aroma are changing every few seconds. At this point, the coffee roaster stops the roasting process at the temperature of his or her choice, and the roasted beans are taken to a cooling tank. At 278° C the coffee beans cease to give off smoke or water vapour. The surface of the beans becomes dull and black. The beans will not expand any further. At 300° C the surface of the beans turns black and sooty. The beans crumble at the slightest pressure. The aroma totally disappears. At this stage the beans have been completely over-roasted and carbonised. Between these extremes, experts agree that the optimal “roasting zone” is between 210–240° C.
After the hidden flavours of a high quality coffee have been brought out by roasting, the coffee must undergo one more process before it can be prepared: “grinding”. Every type of coffee is ground differently. From the finest to the most coarse, these are Turkish Coffee, espresso and filter coffee. Turkish Coffee undergoes a much more complicated grinding process than other coffees since it must be ground to a very fine powder. In order to get the grind right, the process must be carefully monitored and requires expert supervision. As a result, it can only be ground in specially designed grinders. Combining its extensive experience dating back to 1871 with modern technology and engineering, Turkey’s first manufacturer of ground Turkish Coffee, Kurukahveci Mehmet Efendi, uses its own unique grinders. Thanks to modern technology, traditional flavour and quality is now available to all coffee lovers. 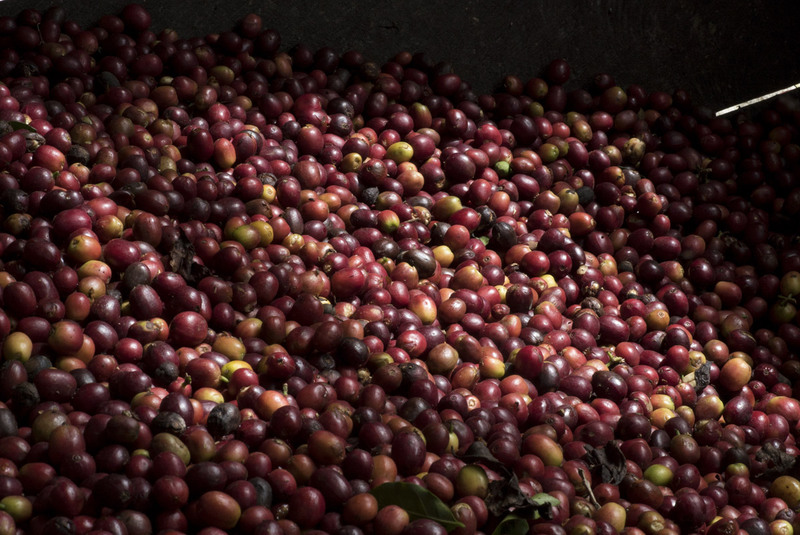 No matter how carefully coffee is processed, only one factor dictates its ultimate quality: “freshness”. After the coffee has been roasted, it begins to oxidise and grow stale. As a result, whether the coffee is to be sold ground or as beans, it must be packaged immediately after roasting. In order to preserve the coffee’s wondrous flavour and fragrance, it must be sealed in airtight containers and protected from environmental factors such as oxygen, moisture and odours until it is ready to be consumed. A number of packaging options have been developed to facilitate this. Known as pillow packs due to their resemblance to pillows, these packs are designed to protect ground Turkish Coffee from all harmful environmental factors. Made from special packaging material, the pillow packs are filled and sealed by fully automated machines. Pillow packs contain 100 g of delicious Turkish Coffee. The special packaging preserves the coffee’s freshness up to its expiry date, keeping it as fresh as the day it was ground. The recommended shelf life is 8 months. Fully automated filling and sealing machines are used to package coffee in specially designed cans that preserve the coffee’s freshness. Turkish Coffee is sold in 250 and 500 g cans. The special packaging preserves the coffee’s freshness up to its expiry date, keeping it as fresh as the day it was ground. The recommended shelf life is 24 months. Due to their resemblance to bricks, vacuum packs are also known as brick packs. 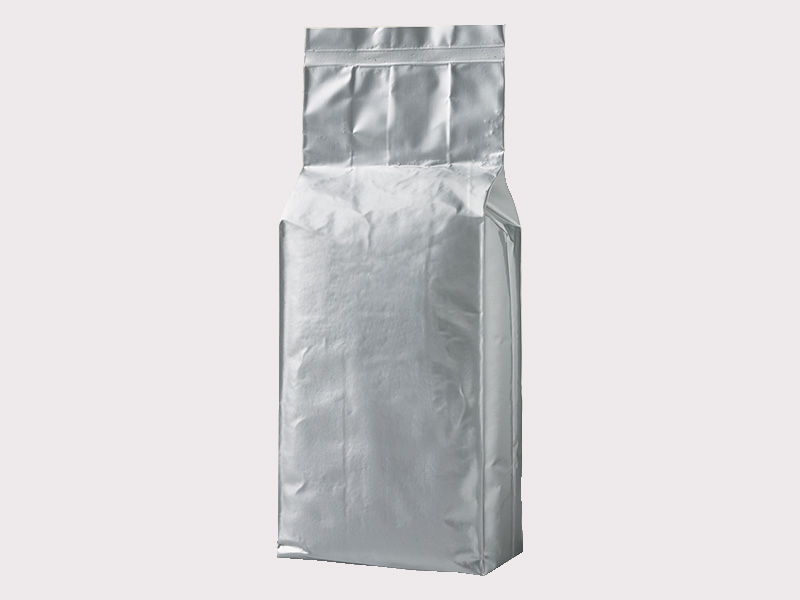 Bags made from special packaging material are filled with ground coffee. Automated vacuum machines then remove the air inside the packet, and the packet is sealed. Kurukahveci Mehmet Efendi ground filter and espresso coffee are available in 250 and 500 g brick packs. The special packaging preserves the coffee’s freshness up to its expiry date, keeping it as fresh as the day it was ground. The recommended shelf life is 24 months. This packaging is primarily used for roasted coffee beans. The beans are placed into the specially designed valve lock bags, which are then sealed airtight. The gases emitted from the freshly roasted and swollen beans are continually released via the valve mechanism, thereby preventing the bags from ballooning. 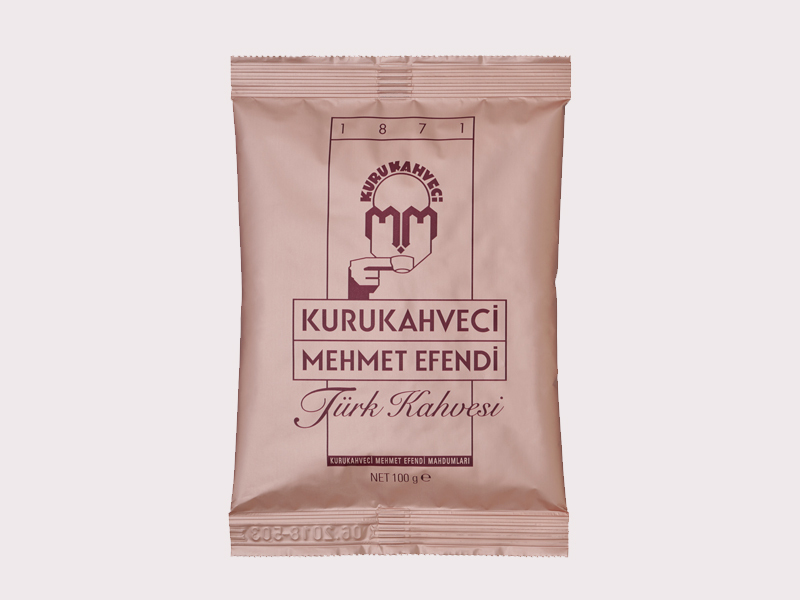 Kurukahveci Mehmet Efendi roasted espresso coffee beans are sold in 1 kg valve lock bags. The special packaging preserves the coffee’s freshness up to its expiry date, keeping it as fresh as the day it was ground. The recommended shelf life is 24 months. Yahya Kemal had enrolled in the “Ecole Libre des Sciences Politiques”. In fact, the whole Quartier was like an open, free university. Conversations about art and literature could be heard everywhere, as if they were snacks served with the coffee. Literary plays were performed in almost every theatre, almost every newspaper printed literary leading articles, there were papers devoted to literature, theatre and art, and many famous writers held literary conferences. Almost every coffeehouse had a famous writer or artist as a regular customer; at almost all of them, the gathering of specific customers felt like academic symposia. Well that’s about it: you never considered getting rich nor surrendering to the will of fate, nor anything else. You now know that all your dreams – even the wilder dreams of your youth – were nothing more than the aroma of coffee drifting out of some coffeehouse in a tiny neighbourhood. Among the many good and bad things that we inherited from the Turks – who should be seen as the fathers of modern Greeks – is coffee; the famous Turkish Coffee. We should immediately point out that most of the Greek words kafes [kahve] (coffee), kafenes [kahvehane] (coffeehouse), kafecis [kahveci] (coffeehouse owner), tabis [tâbi] (subordinate), yedeki [yedek] (spare), briki [ibrik] (ewer), flincani [fincan] (coffee cup), delves [telve] (coffee grounds), kavurdistri [kavurucu] (parcher), kaymaki [kaymak] (cream), cezves [cezve] (coffeepot), theryaklis [tiryaki] (addict) have Turkish roots. You have to stop by Aux Deux Magots in the early morning: coffee, a croissant, another coffee. A little ahead of you, before your opium has kicked in, will be an old American woman writing a letter. Could it be that she knew Fitzgerald or Gertrude Stein? Suddenly the roaring 20s come to mind: the years of Hemingway, Djuna Barnes, Joyce. In actual fact, they are more associated with “tea”. COFFEE (café). Clears the mind – Only the coffee from Le Havre is good. – At an important meal, it should be drunk standing. – It is cool to drink coffee without sugar; it gives the impression that you have lived in the East. Turks wearing salwar pantaloons, tabards, and fezes; Turks with wide foreheads, thick eyebrows and thick napes; Turks with long silver watch chains, their wide knees splayed to the sides, seated on little stools, their hookah pipes set up, sipping with great, deep pleasure from large cups. A café terrace is more fun than any open-air theatre you can think of. It is the first step towards that stage of form on which we can believe that we are all free, famous, and loved, or at the very least at peace with the rest of the world. When he isn´t painting his boat, Niko is drinking rakı, Niko goes silent. It´s his silence that covers the tables. Those whitewashed, uneven walls are his loneliness. A ship he bought from a shop in Constanza stands right next to the samovar. This picture is from Piraeus, these shellfish are from Batum. These nets poured tons of fish onto the shore. Niko blends his coffee with the screaming seagulls of old summers, with the swordfish and octopi which escaped harpoon and the hottest suns. Sea-scorpions still dwell in the depths. Messeret Coffeehouse serves the whole of Istanbul. There isn´t a single man of letters who hasn´t sat there at least once. But coffee is associated more with journalists than literary types. Most of them come here to write their news and articles for the newspapers. Hoca Kadri Efendi, a member of the Young Turk movement, spent his whole day at this coffeehouse [La Closerie des Lilas]. The poet Yahya Kemal Beyatlı used to say that he was a regular at that coffeehouse for 9 years during his student days. According to the metal plates on the tables, Lord Byron, Anatole France, André Gide and Lenin were also regulars. Yahya Kemal met a pre-revolutionary Lenin in this coffeehouse. Many renowned musicians have been inspired by coffee, and Antonio Vivaldi and Carlo Goldoni even composed a work entitled “La Bottega del Caffe”. Yet the musician on whom coffee had the greatest impact must be J.S. Bach. This great musician poured his love of coffee into the notes of the Coffee Cantata, which was published in Leipzig in 1732. Bach composed the Coffee Cantata around a poem by Picander. Bach was inspired to compose the cantata out of protest against the fact that Germany was trying to outlaw the drinking of coffee by women as he felt that the appreciation of coffee should not be subject to sexual discrimination. Museums all over Europe are filled with paintings inspired by coffee. They generally portray coffeehouses frequented by artists, coffee drunk at home and people enjoying a chat over a cup of coffee. The world’s first depiction of a coffeehouse was painted by the Dutch artist Adrian van Ostade. Paintings by artists such as François Boucher, Franz Schams and Jean Léon Jérôme offer great insight into both early coffee culture and the coffeehouses of the past. In Turkey, Ali Rıza Bey of Üsküdar painted important works on the subject of coffee. His life spanned the late 19th and the early 20th century, and he specialised in charcoal drawings of summer and winter coffeehouses, coffee stoves, coffee cups, coffeepots (cezves), coffee cabinets and itinerant coffee vendors. Today, many of his extant paintings can be found in private collections. As coffee and coffeehouses became an integral part of social culture, coffee became the only drink in the world to have spawned a whole related culture. Ever since the first coffeehouse opened in Istanbul in 1554, coffee has had a tremendous impact on art and culture. Countless artists, students and teachers have come together in coffeehouses to read books, perform plays and hold lively discussions. This situation is not confined to Istanbul; throughout the world, coffeehouses serve as meeting points for intellectuals and coffee has long been the favourite drink of artists. For many years, coffee has been the chosen beverage of artists; for artists and thinkers such as Alexandre Dumas, André Gide, Molière, Victor Hugo, Honoré de Balzac, Voltaire, Ludwig van Beethoven and Immanuel Kant, coffee was much more than a drink: it was a lifestyle. Coffee has served as a platform for friendship and conversation all over the world and has been a source of inspiration for many works of art.